Israel overtly uses culture as a form of propaganda to whitewash or justify its regime of occupation, settler-colonialism and apartheid over the Palestinian people. 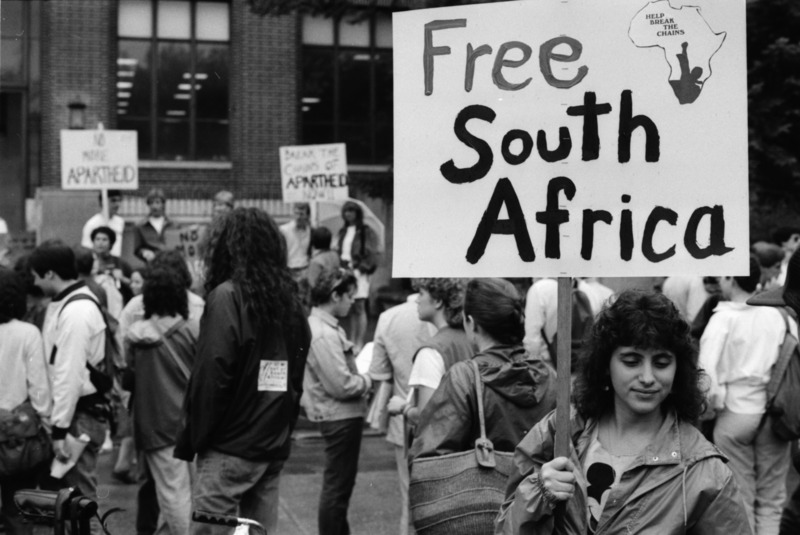 Just as South African anti-apartheid activists had called on international artists, writers and cultural institutions to culturally boycott South Africa, PACBI urges international cultural workers and cultural organizations, including unions and associations, to boycott and/or work towards the cancellation of events, activities, agreements, or projects involving Israel, its lobby groups or its cultural institutions. International venues and festivals are asked to reject funding and any form of sponsorship from the Israeli government. Thousands of artists across the world now refuse to perform in Israel, including a host of global superstars such as Roger Waters from Pink Floyd, Lauryn Hill and Chuck D.
Israeli government officials have summed up how Israel instrumentalizes culture to cover up its grave violations of international law. "We are seeing culture as a hasbara [propaganda] tool of the first rank,” one official admitted, “and I do not differentiate between hasbara and culture." Israel’s cultural institutions are part and parcel of the ideological and institutional scaffolding of Israel’s regime of occupation, settler-colonialism and apartheid against the Palestinian people. These institutions are clearly implicated, through their silence or active participation, in supporting, justifying and whitewashing Israel’s occupation and systematic denial of Palestinian rights. When international artists perform at Israeli cultural venues and institutions, they help to create the false impression that Israel is a “normal” country like any other. The absolute majority of Palestinian writers, artists and cultural centers have endorsed the cultural boycott of Israel, and there is a growing number of anti-colonial Israelis who support BDS, including the cultural boycott of Israel. 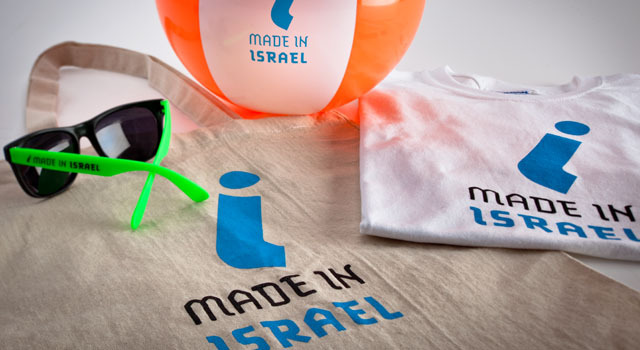 Israel tries to create a positive image of itself through "Brand Israel", in response to increased international organizing for Palestinian rights. 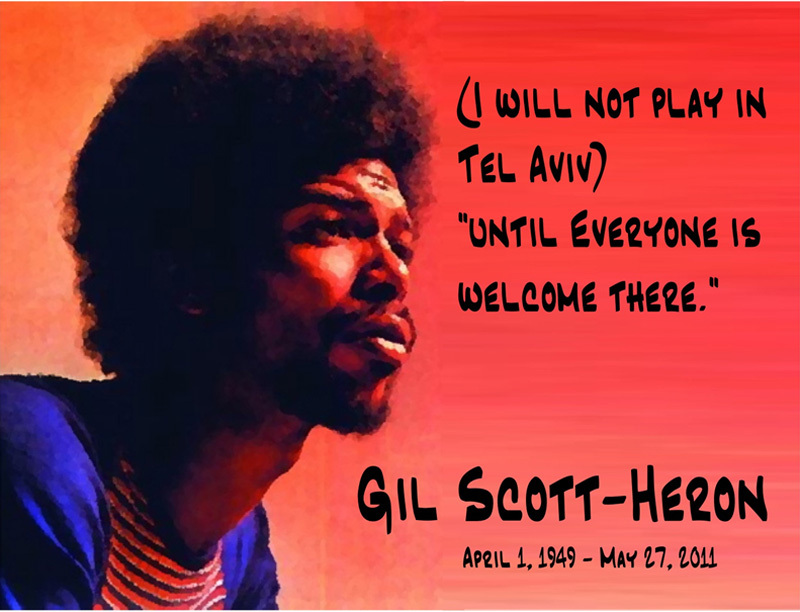 Musician and activist Gil Scott Heron is one of many artists who has refused to perform in Israel in protest of their apartheid system and violations of Palestinians' human rights. Arabic books stolen from Palestinian homes by Israeli forces during the creation of the Israeli state. 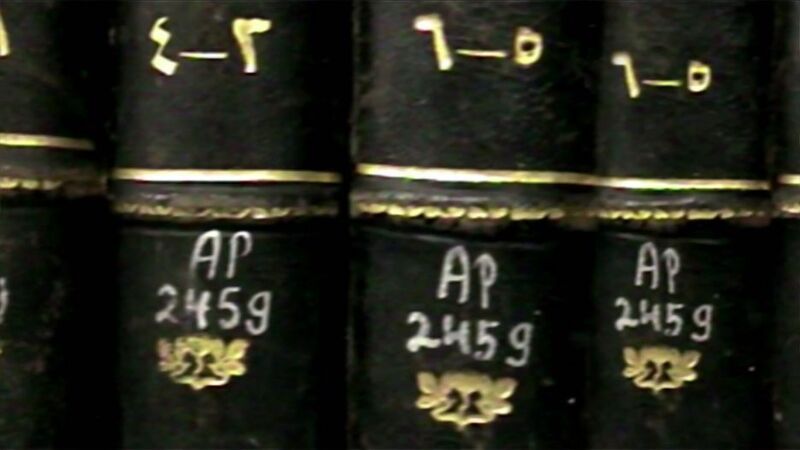 They are now held in Israel's National Library and marked as 'abandoned'. A protest against South African apartheid. Thousands of artists and cultural workers have signed public statements in support of the cultural boycott. 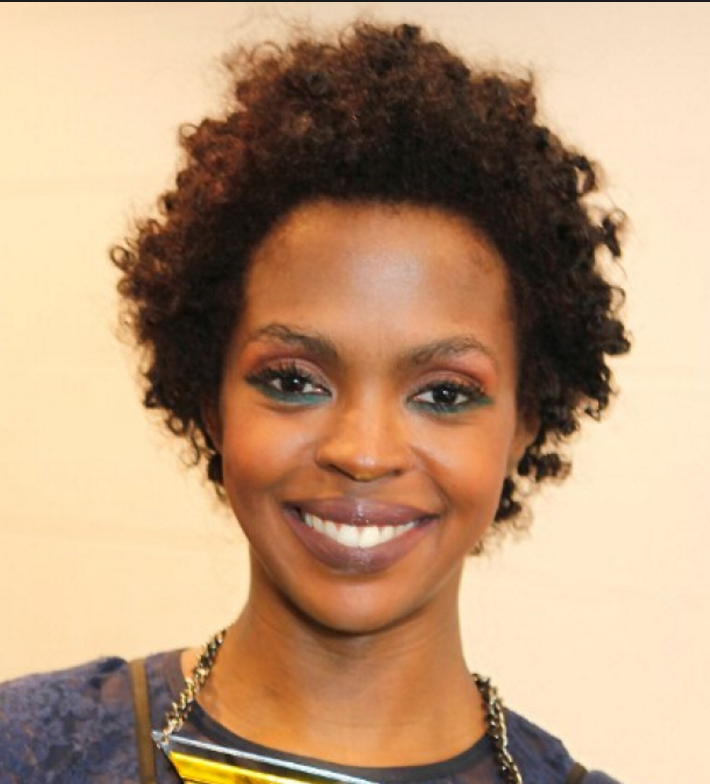 In 2015, more than a thousand cultural figures in the UK signed a cultural boycott pledge. BDS-related initiatives have been launched in Montreal (Canada), Ireland, South Africa, Switzerland, Lebanon, the US, among others. 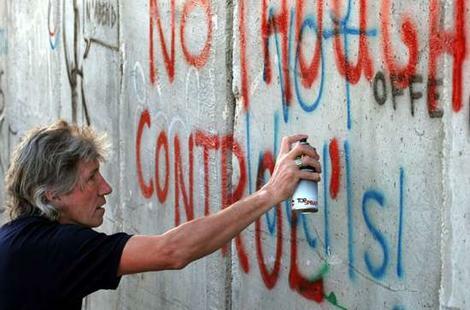 Distinguished cultural figures who have endorsed the cultural boycott of Israel include the late Stéphane Hessel, Holocaust survivor and contributor to the Universal Declaration of Human Rights, Chuck D (pictured left), Roger Waters (pictured above spray painting apartheid wall), Talib Kweli, John Berger, Arundhati Roy, Iain Banks, Judith Butler, Naomi Klein, Ken Loach, Alice Walker, Angela Davis, Mira Nair, Mike Leigh and many others. “Criminalizing Israel and turning it into a pariah state on the world stage is the way forward for justice for the Palestinians." "Palestinians are not asking you to save them. By calling for a boycott of Israel, they are only asking you not to help Israel oppress them." "When the time comes that Israel behaves respectably...then I will be first in line to go and share anything that anyone wants to with my colleagues...But until that happens I think it's appropriate for all of us to leave a very clear message that we shouldn't and can't do that." 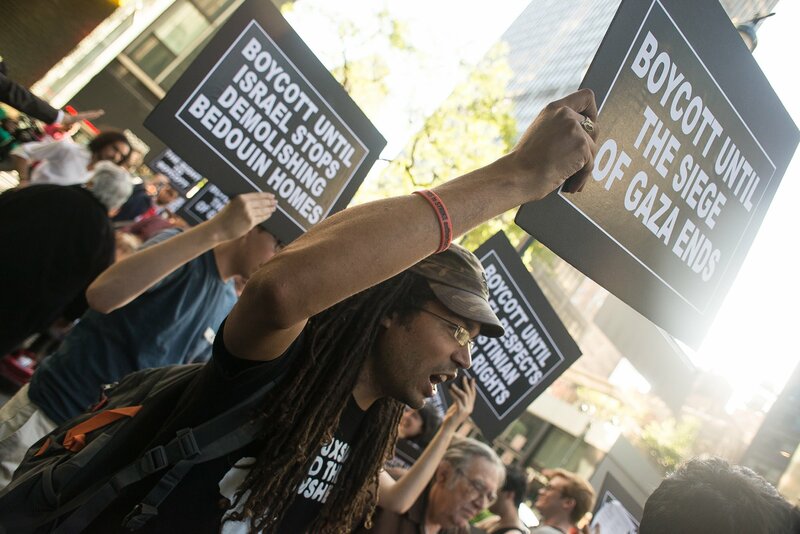 "The BDS initiative calls for effectively isolating Israel... 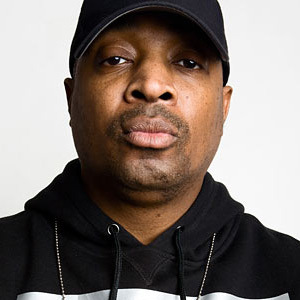 I believe [it] is a moral strategy which has demonstrated its potential for success." "As South African Artists and Cultural Workers who have lived under, survived, and in many cases resisted apartheid, we acknowledge the value of international solidarity in our own struggle... we respond to the call by Palestinians, and their Israeli allies, for such solidarity." "We, the undersigned Black activists, artists, scholars, writers, and political prisoners ... wholeheartedly endorse Palestinian civil society’s 2005 call for [BDS] against Israel and call on Black and US institutions and organizations to do the same." "... I feel I must join the many Jews and non-Jews, Israelis and Palestinians, queers and otherwise, who are part of the growing global BDS movement"
"I will go to Israel when apartheid is over." "As a South African I witnessed the way the cultural boycott ... helped apply pressure on the apartheid government and its supporters. This Artists’ Pledge for Palestine has drawn lessons from that boycott to produce an even more nuanced, non violent way for us to call for change and for justice for all." "[C]ulture cannot be artificially separated from politics, nor can cultural figures abdicate, with clear conscience, their moral obligation not to allow their names and their work to be used as fig-leaves to cover up injustice and human rights abuses." "Today there’s no question: an artist or intellectual who collaborates with activities funded or approved by the Israeli state is complicit in Israel’s ethnic cleansing of the Palestinians." "Then there are occasions when merely having your name added to a concert schedule may be interpreted as a political act that...and it may be assumed that one has no mind for the suffering of the innocent." "The BDS movement is showing a potential for upsetting the existing balance of forces in a way that no other strategy has been able to do since the Oslo Accords were signed." "Where governments refuse to act people must, with whatever peaceful means are at their disposal. For me this means...joining the campaign of [BDS] against Israel." "I would urge all writers...to consider doing everything they can to convince Israel of its moral degradation and ethical isolation, preferably by simply having nothing more to do with this outlaw state."